Vinettou is back with a vengeance, this time with his superhero S.O., Vinetta. I feel like having an eggplant salad, especially since the two eggplants I bought a while back have started to turn bad in my fridge, so I decided to investigate easy recipes. Salata de vinete (Eggplant salad) or Vinetta is both a Romanian and Hungarian mashed eggplant salad made of grilled, peeled and finely chopped eggplants, sunflower oil and chopped onions. The eggplants are grilled until they are covered with black ash crust. The crust is cleaned off and the remaining cooked eggplant is mashed with a blunt, thick wooden knife on a wooden platter (popular belief has it that using a metal knife will turn the eggplant flesh black). 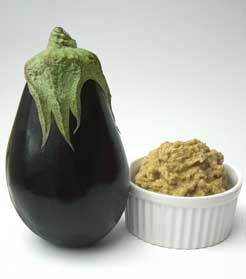 The eggplant mash is mixed in a bowl, stirring continuously, with sunflower oil, chopped onions and salt. The mix is beaten vigorously. Crushed garlic and ground pepper may be added too. Instead of oil, mayonnaise can be used. In Bulgaria a typical eggplant appetizer is kyopolou, it is made with roasted aubergines and red peppers. In Russia and Ukraine, a category of similar dishes is known as baklažannaja ikra (Russian: ??????????? ??? ?, literally "eggplant pâté" (Note that "ikra" in this context means "puree", mashed "ragout" or "pâté" rather than the homonym "caviar") and some versions add chopped tomatoes to the basic recipe. Another eggplant salad popular in Russia is called he iz baklažanov (Russian: ?? ?? ????????? ?, and it is probably influenced by Korean cuisine). Eggplant he is based on julienned (instead of mashed) cooked aubergines and other vegetables, prepared with concentrated vinegar. After adding the vinegar, it is set aside for several hours to cure before eating. If you would rather do this fast, you might want to peel them off when raw, cut them in little cubes, spray them with the lemon juice and sprinkle a tsp of salt. Brown them in oil for 4-5 min then add 100 mL of water and boil on medium heat, covered, until the water is gone. Mix them up in a blender with oil and the onion and you’re done! And if you would want a similarly creamy and refreshing drink when you’re done with the “Vinetta”, I’d recommend the Avocado-Citrus smoothie. Yes, it will make you fat with 1 avocado, one orange, some milk and honey – to which I add lots of ice cubes – but it’s the “good” kind of fat! Thank you for reading (mulţam fain pentru cetire)! Publicat Wednesday, October 12, 2011 . Similar articles under the following categories (poţi găsi articole similare sub următoarele categorii): fun ( ), lucrand la fatada ( ) . Dacă ţi-a plăcut articolul, PinIt-uieste-l, ReddIt-eaza-l, stumble-uieste-l altora, trimite-l pe WhatsApp yMess şi consideră abonarea la fluxul RSS sau prin email. Ma poti de asemenea gasi pe Google. Trackback poateputea fi trimis prin URL-ul de sub Comentarii.